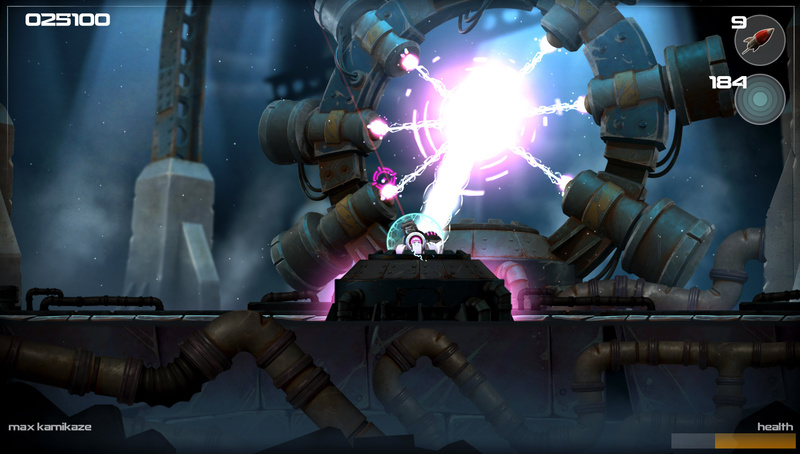 Just recently Two Tribes lifted the lid on its shooter, RIVE, which it had been teasing for a number of months. It was a welcome landmark for a company that's endured a difficult year, with co-founders Collin van Ginkel and Martijn Reuvers shutting down the development company and forming a smaller studio due to financial difficulties. The cross-platform (Wii U and PC) release of Toki Tori 2+ clearly hadn't achieved sufficient success, though the publishing arm of the business was kept separate from the closure, meaning that the multiple Two Tribes releases on the market — including the Classics range on Wii U — weren't affected. Now with a small and lean development team, it's back to the start for Two Tribes, with RIVE's reveal allowing discussion around the company to focus on games once again. We caught up with Collin van Ginkel to chat about the new development team, RIVE — loosely confirmed for PC and 'consoles' — and the company's continuing outlook on the eShop for its projects. First of all, we last spoke in January when you were rebooting the development arm of the company. Can you give us an outline of what's happened since? Well, it's taken a while for us to get used to the new situation. We're down to three core developers now instead of 12. I think we're all settled in now though and we're having a lot of fun focusing on making games again! With that core team of three people, has it felt like a return to the company's beginnings? Very much so. For me personally it's been very liberating, and I know the other founder Martijn loves the fact that he can work on the game code again too. Looking back I think the old Two Tribes wanted to go back to its roots already with Toki Tori 2, but became too big for its own good. The reveal trailer for RIVE certainly shows an art style that can be loosely tied to Toki Tori 2, particularly the lava effect. Has it been a simple or difficult challenge to utilise that engine for a fast-paced 2D shooter? We've had to change the way we work and where we spend our time on. We're not creating any new technology any more for instance for RIVE, but we're re-using whatever Toki Tori 2 had in creative ways. So you may see some similar effects or menus coming by, but the experience is totally different. 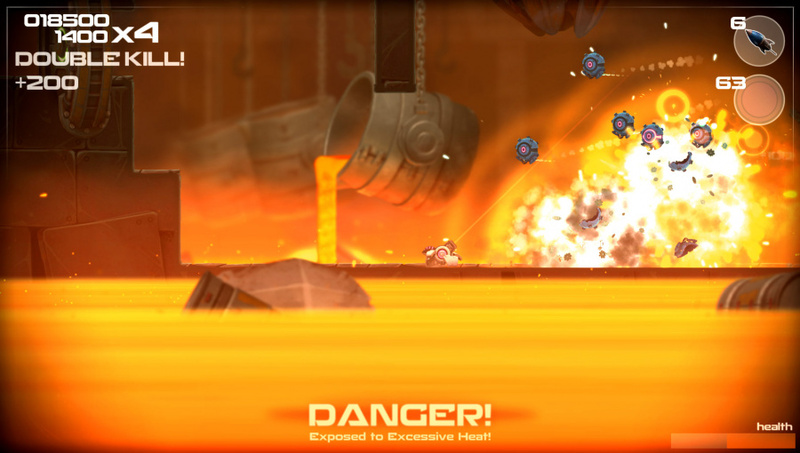 It's been very interesting to see Toki Tori 2 warp into RIVE. The first tests actually had Toki Tori 2 flying around in the world with Berrybugs to shoot at! With a tank-like vehicle it looks like riding rails and solid surfaces is a feature, it seems similar though certainly distinct from Scram Kitty and his Buddy on Rails. Is the goal to limit movement to up the intensity, and how much can we expect to see vehicle transformations, like the flying seen at the close of the video? We've heard more people compare it with Scram Kitty, but the funny thing is that we don't have on-rails sections at all. We give players full control over movement, sometimes with and sometimes without gravity. We are planning some auto-scrolling parts as a tribute of sorts to Gradius, but won't remove direct control from the player there. With there be multiple vehicles and weapons throughout RIVE, or is it being kept simpler than that? We're sticking to one vehicle, but we do give players a launcher that can house different ammo. Right now we have EMP grenades and Homing Missiles for that, with more to be added as development continues. Are there plans for multiplayer, whether co-op or competitive, local or online? We are fooling around with the idea of local co-op, but that totally depends on how easy it'll be to implement. If we run into problems early on we'll skip it to focus on the main game. Are there any mechanics you can describe that you feel will help this stand out in the shooter genre? Definitely the robot hacking mechanic. We've got collectible hacks in the game that you can upload to your enemies if you can get close enough. Hacks can change robots to do whatever we want, such as invert their firing direction or let them heal you instead of hurting you. I even made a hack that let's a robot play Dubstep music! As a first project 'back', is this going to be a relatively short, high intensity game, or will it offer quite a lot of value and volume in content? We're going for a short action packed game, definitely smaller than Toki Tori 2. However we'll have a mission system and high scores to keep players entertained after completing the story. You've already told us that you're gunning to bring this to Wii U — can you expand on progress so far? Are you optimistic of releasing this on the system? Since we're just with three people now we have to be careful what we promise. We are currently focusing on the core experience to be a great experience on our work PCs. Having said that, it's up and running right now on Wii U, but at about 30fps instead of the 60fps we need for this type of game. If this does come to Wii U, will it utilise its controllers or capabilities in any unique ways? We only started thinking about that fairly recently. Off-TV play is a given, but nothing to report yet on the GamePad front otherwise. Is Two Tribes currently working on publishing or porting any third-party games, in addition to developing RIVE? Not at the moment. Personally I love being able to focus on one thing, but it does put a bit more pressure on RIVE being a success. As a company you've always shown a lot of support for Nintendo platforms; is that still one of your priorities moving forward? We've always looked at it at a case by case basis and lots of times in the past it made sense to go with Nintendo. I don't expect this to change anytime soon. It might be interesting to note that we're currently generating more income from Nintendo's eShop than we are from Steam, or any other digital shop for that matter. This was definitely not the case a few years ago. Steam is overflowing with new games at the same time that PC gamers get conditioned into thinking everything should be free or pay-what-you-want. We're not making millions by a long shot, but the lower amount of new releases means we get more visibility and thus more sales on eShop. With the project still a little way off yet, is there a particular message you'd like to share with our readers? The Nintendo Life community has been supporting us for years and we hope they will love where we're headed next! We'd like to thank Collin van Ginkel for his time. "Currently earning more from the eShop than "any other digital shop""
Then why was further support for the level editor for Toki Tori canceled because there was "no demand" ? If this decision was made before their products kicked off properly on the eShop, it basicly sais that it wasnt a demand problem but more a premature dismissal of the service due to popular opinion. Dont get me wrong, i adore Two Tribes works, pretty much all of them and bought every game they offer on nintendo systems on day one no less. My statement is not meant to discredit them or attack them in any way, im just wondering where this sudden change from "its not worth it" to "its the biggest source of income" came from. Delighted that these guys are on their feet again! I was playing and getting into Toki Tori 2 when they announced all their closures on Miiverse. @Einherjar I wondered that, as well. I'm a huge Two Tribes fan and it seems they're talking out of two mouths. 1. It was before the release of the Two Tribes Classics series, so at that point nearly all of the income came from Toki Tori 2. 2. They had Toki Tori 2 on the Wii U and Steam. The Wii U version sold more, but not enough to meet their expectations, and as the Steam version didn't sell much they obviously needed even better sales from the Wii U version than expected. 3. The Wii U version was delayed by nearly 4 months. That's 4 months worth of payments to the employees and paying the bills without any extra income. 4. The Toki Tori 2+ update also took a lot of time from the team. It was supposed to lure more people into buying the game. Sadly, it still didn't do much on Steam so they needed more people to buy it on the Wii U. 5. So, in the end they needed much more sales from the Wii U version than anticipated because of the bad sales of the Steam version and the delays they had to go through. Even though the game sold perhaps "ok" in normal circumstances, it simply wasn't enough to keep the studio alive. 6. Now as they've released the classic series and they have Toki Tori 2+ with sales from time to time (and they have EDGE and Toki Tori VC game on the 3DS eShop), it's no wonder that they can say they are getting more sales from the eShop than from Steam. So, I'm not surprised at all by any of this. It was understandable that given the situation back then there it wasn't financially feasible to work with the level editor on the Wii U version. And it's understandable that now, much later, things are going much better. We have to remember that to get to where they are now, they had to end their studio and let many paid developers go, so we can't say that they just should've endure it longer. Had they done that, there might not be even this two-man publishing company anymore. @Airola Edge / Rush / Toki Tori was on Mobile and Steam first. What they did was a similar technique to what Hollywood does. Load up a new company with debt and then liquidate it and keep the assets. (Ripping off the creditors in the process). @Airola But if you need a certain version, thats already surpassing every other to do better, isnt it kinda counterproductive to "cripple" it by leaving out a level editor ? Leaving out features in a game is one thing, but the public opinion it generates is another. During the games release, the WiiU was still struggling and people were more than glad to support devs who supported the system. For them to neglect such a popular feature and use "no demand" as an explaination just gave people the impression, that they also dont really care, especially considering that the WIiU Version was infact the money maker. Decisions like that make yourself untrustworthy. Some people look at TT the same way they look at bigger studios, crippling their game for no other reason than to call thesystem they released it on a failure because it didnt sell 2 copys per person. Reputation goes a longer way than sheer, naked sales numbers. A good reputation, especially among the Nintendo fanbase, almost ensures that these people will buy further products from you just to support you. Im just curious what drove them to use the "no demand" excuse while still saying its the best selling version, instead of saying "it simply wont be profitable at this time, were focusing our recources on other projects at the moment"
@unrandomsam Well, Toki Tori was on WiiWare first, but EDGE and RUSH were on other platforms. And as Collin said, back then the revenue from Steam and other digital platforms was way better than on WiiWare, which is not a surprise as Steam and Mobile were huge for many developers. Things have changed only just recently. Nowadays Mobile and Steam are filling up with games at a faster pace and it's much more difficult to sell their old catalog and their newer games on those platforms. @Einherjar Yeah, it's true that the collective mind of game enthusiasts is a thing on its own level. One bad wording on the internet can cause tons of trouble for people in the gaming business. I've personally never understood that, so perhaps that's why I can't understand the problem here either. On the other hand, it's also true that being a developer with no stains on their past makes the same people to be even more supportive, like you said. Personally when things like this happen and the developers do things that the gaming enthusiasts loathe, I usually just shrug at it as I have no idea what it takes to keep a game business afloat. I have no idea how much stress and trouble little things like adding a level editor can cause. I'm sure it's much more work to get it work on the Wii U and Miiverse than it is on PC though. Perhaps there really wasn't that much of demand back then. To be the biggest seller on eShop when compared to other platforms doesn't yet mean a thing. If the revenue on the other platforms is abysmal, being "ok" on other platform might not be enough. Maybe there really just wasn't enough demand to be able to continue that and keep the studio alive. @Airola To be honest, its not the lack of this feature itself, it was just the wrong wording at the wrong time. Everyone used this excuse to shun the WiiU for no real reason whatsoever. They blamed poor sales on the system, whily the game was openly presented as the least complete version, lacking any further support (DLC for instance) and, in some cases, even cost more than others. The answer Two Tribes gave at the moment just didnt come off as honest but rather as bandwagoning on the universally excepted popular opinion. "Abandon ship, its not worth it" even when this particular version is the best selling. That simply doesnt make sense and its a quick way to loose the trust of your fanbase. There is no question about the fact, that such an editor is way easier to put together on PC than on any console, let alone working MiiVerse integration and whatnot. Im not judging them for not releasing the editor as the reasons behind it are very clear and very understandable. Im also aware of the fact, that being the "best selling" version didnt meant that they are now swimming in money. The best of the poor is still poor. Again, this is not about attacking their decision to exclude additional features, its just about the fact why they announced it like that. It paints a really awkward picture, if you say you leave such a feature out due to lack of demand, and the worse selling version (the one with even less demand) gets it for free instantly. This Rive game will probably be as big as Guacamelee! Shovel Knight, or Armillo, just to name a few. Toki Tori never drawn much of an audience. Percentage wise, the eShop generates more income for our little studio when looking at all games combined. This does not make Toki Tori 2+ a success all of a sudden, it's just a comparison to the other shops. When we still had 12 people, making an editor feature for a game that underperformed and didn't recoup even half of the costs does not make sense and could've gotten us in deeper problems than we now had to face. Now this game looks really good. Good enough that I would consider a day one purchase. I'm keeping an eye on this one. Still not sure about the name but i like what i see so far. Local co-op would likely make this a day 1 for me. I don't think you got all your facts straight. I don't think we ever said the Wii U version was the best selling. Toki Tori 2+ costs the same and has the same content on all platforms. We didn't just say 'no demand', we wrote a comprehensive blogpost on all the reasoning behind it. Have almost every Two Tribes game so far, they are all fun. Looking forward to Rive. @Collo The statement regarding the "Openly presented as the least complete version" wasnt directed to you, it was an open statement regarding games like Injustice not getting further support and wondering about sales, the same with Arkham origins and so on and so forth. It was just that this statement came at a time, where these "excuses" were used constantly and without a proper explaination. Like i said, it wasnt directed towards Two Tribes specifically. But thanks for posting your blog entry. You may be right that im not fully informed on this specific matter, but i will read up on it. The "no demand" comment was in regards to whether they would be making a Toki Tori 3 at all, not anything specifically to do with Nintendo's platforms. @Collo With all due respect, I believe you saw the writing on the wall when you released TT2+. There was very little chance at that point things would turn around and suddenly a level editor would become viable. Except you still insisted it was in development for release in the future either shrewdly or desperately to improve TT2's prospects. Ultimately, leaving your most loyal customers in the lurch. We fully support Two Tribes and certainly desire success for you and your company. So no one is saying you should have simply bit the bullet and attempted to polish a turd (sales-wise), but there is little doubt this whole affair was mishandled rather deceptively and some of us early TT2 adopters probably do have the right to healthy skepticism. Toki Tori always looked like great game design, but its slow pace never appealed to me enough to purchase. 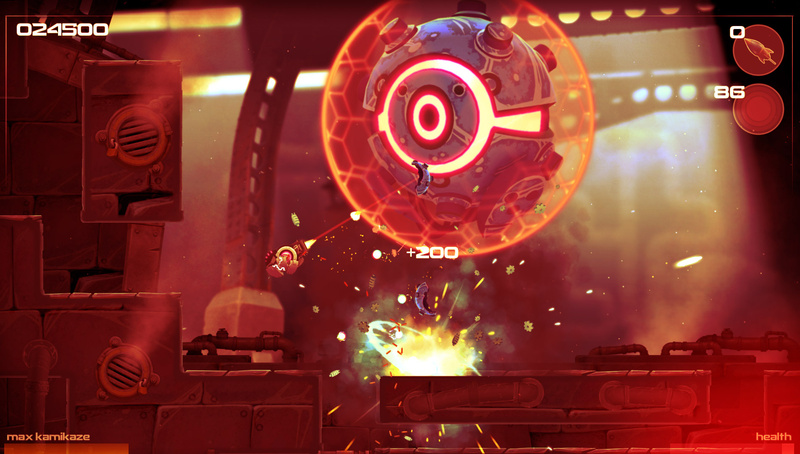 Rive, on the other hand, looks like an instant buy if it comes to WiiU. Finally got around to playing my Steam version of Toki Tori (via one Steam sale or another) in my attempt to clear my Pile of Shame. While puzzle platformers are not generally my cup of tea, I am enjoying this more than Mario vs Donkey Kong. At least I have direct control of the character. So far it has been decent enough, I probably will eventually pick up the sequel on Wii U (my preferred platform), and am now a little more curious about other projects. I always get either bored (Rush, Edge) or stuck (both Toki Tori games) in Two Tribes games so I doubt I will buy another one. Hope this one allows you to find the (mainstream) audience you seem to look for. very nice interview once again. Just my Two Cents here... Local wifi really does stink just so you can get the multiplayer option stamped on your game. Do it right online multiplayer please. I love small companies making it and hope the best for you guys. Loved Toki Tori 2+ more than most, and am looking forward to Rive (if it comes out on Wii U eShop). Bset of luck to the restructured Two Tribes. I don't trust them after the toki tori 2 fiasco. As someone who bought it day 1 for the promised level editor I still feel burned and won't be buying Rive. I bought Toki Tori 2 close to launch. I got an awesome, challenging and great game day 1. I enjoy Two Tribes games a lot, and I do not feel burned, deceived or slighted in the least. Plans change, business is hard. The game is still great, and I am very satisfied with my purchase. Thank you so much for making great games, @Collo ! I am happy to see that the trouble your studio has been in hasn't shut you down, and very excited to try out RIVE. I hope there will be a demo! I absolutely adored Toki Tori 2, such a fun game without any hand-holding. But you still have all the actions required to solve all the puzzles, just need to bring your noggin I've bought all of Two Tribes games available to me on Wii U & 3DS, except Toki Tori on GBC VC, I'll have to rectify that. I just like throwing my money at worthy developers. It feels good & I get a fun game out of it I'm excited for RIVE, looks great! @3Daniel I'm with you. I knew TT2 was a stretch at the launch price, but I bought it day one with good faith in Two Tribes. The promised level editor went a long way to allay my fears about the price point with some consolation that I would be able to recoup a worthwhile entertainment return with such a utility. Instead, I actually regret investing any money on TT2 as no one in my household is interested in playing it for more than 5 minutes due to sheer boredom. Toki Tori 2+ was more than worth the 13,49€ it was at launch. Even without level editor I played it for 30+ hours and that's amazing value, not even counting in the ingenious puzzling, fresh gameplay, and beautiful design. My family & friends don't like it either, but that's because they don't like using their brains in games, plus they've got a short attention span, and can't tell a good game from a bad one. I think RIVE has a larger audience because it's action instead of puzzle. I wish them developers good luck. I just hope its of equal brilliance and a great continuation of Two Tribes' catalogue. Day one for me. @SKTTR TT2 gives you almost no incentive to progress beyond some nice, polished visuals and audio. Go ahead and blame the audience, but when your game has none beyond the most passionate and determined... Well, I generally consider it something wrong with the game itself. That is, if the goal is objective market-based success. As a piece of art, the judgement terms are obviously much more subjective. So I don't think you're wrong, per se, but I'm not about to blame the consumers for TT2's sales performance, even if I would for any other game. @Collo you may think this is a bad idea but to generate more profits maybe you should release all your games on PS4/XBOX1 and other platforms? @ACK Toki Tori 2+ gives you a unique set of actions to try at clever and fresh puzzles. It's 100% Core Gameplay. That's what I want. Challenge and reward! Progress! I could care less about virtual incentives because I have my own real incentive: playing good games. Oh, and good audiovisuals are just a plus. Market-based success? The mass market are not the core gamers! Toki Tori 2+ and Scram Kitty too, are not just games that try something different. First and foremost they are about skills and brains and they are for core gamers (what you call passionate and determined gamers). Gems like these are the reason why I still enjoy playing Nintendo. Market-based success? Hahah, why should I care? These games are gifts by determined and passionate developers to determined and passionate gamers! Call it core gameplay, but the way Toki Tori 2 progresses and dishes out that gameplay is both restrictive and obtuse, encouraging a general feeling of aimlessness. Compounding this, the game begins with a very low difficulty and requires quite a bit of groundwork to pick up momentum. It seems most gamers need a high degree of personal motivation to plow through the first 30 or so minutes without becoming bored or discouraged. And I really don't know about calling a product that must be purchased with real money, "a gift.". Fun game, or not. Rive looks absolutely awesome, I hope they're able to release it on WiiU at the same time as PC somehow. I'm picking it up Day1 just based on that video. @ACK You think it's restrictive and obtuse? Probably because you like to be restricted by obtuse goals. I like the freedom (you call aimlessness) because I can explore and have my own goals: I just see some golden thingies in hard to reach spots and I know my goal is to collect them. I see a wall at the end of the road and I know my goal is to turn around and find another way. I may try stuff, I may waste time, but I feel very rewarded upon solving a puzzle. I even remember the great subtle tutorial in the beginning and throughout the game, and it's kinda sad to see you and many others blind to it as you're most likely not paying attention to the surroundings and details in games anymore. And I think you've got something wrong: It's an openworld puzzle adventure core game for puzzle gamers and adventure gamers. Those gamers like and beat Toki Tori 2+! People that don't like a certain genre enough don't give them games enough time and cannot form a valuable opinion. I wish I could go two years back in time, and experience Toki Tori 2 for the first time, with no expectations and no memory of the game. I loved everything about the game, the freedom, the exploration, and especially the fact that the whole game world was available from the start! The only boundaries were the puzzles my mind could not solve at any given time. Toki Tori 2 is easily among the 20 best games I've ever played, maybe even one of my ten best game experiences.